This worm-encrusted mockery of a man broadly resembles a human body, entirely entirely of dead flesh-eating maggots. It can be found near corpses, of which it feeds, specially in dungeons or ruins which belonged a powerful Magic-User. The creature is a by-product of the magic energies that have been liberated in the vicinity. Whenever a Thing that Crawls is encountered, all characters must save vs. Poison or get repulsed. Repulsed characters gets a penalty of -1 to all their Attacks, due to the nausea and retching caused by the bad smell the creature emanates. If a charge attacks succeeds, the victim must save vs. Paralyse or is grappled, covered in maggots. The victim can't move for the rest of the round; every subsequent round the victims has to save vs. Paralyse at a cumulative penalty of -1 or remain paralysed, losing 1d4 hp every round, including the first round. If the Thing that Crawls is attacked while grappling a victim, half damage will got to the Thing (rounding up) and the other half, to its victim (rounding down). Axolotls are distantly related to salamanders, but they have four legs and look more like a common salamander, only much bigger. It comes from the Elemental Plane of Water, and sometimes can be found on the material plane, in lakes, ponds, and artificial canals, that mystically connect to the elemental plane. Its skin is soft, but due to its magical nature, it can only be harmed by magical weapons. Axolotls possesses features of salamander larvae, including three pairs of external gill stalks and a caudal fin. Its head is wide with lidless black eyes, short limbs and long digits. Its color varies from white, pale pink and red, to dark grey and black. Its mouth is filled with vestigial teeth that never fully develop, but its bite is strong and painful. Axolotls possesses a hypnotic gaze. An intelligent creature that looks the axolotl in the eye, must save vs. magic or swaps mind with the creature. The mind-swap lasts for as long as the axolotl wants, up to one whole day. If the axolotl is killed while in the "borrowed" body, the other remains an axolotl until he can swap minds with another person. Last edited by Daucuscarota on Thu Dec 21, 2017 10:44 pm, edited 1 time in total. Thing That Crawls is thematically very close to the Maggot Man (inspired by HP Lovecraft, "worm that walks"). At first, I was like "this is essentially a duplicate", but looking again I can see this one working alongside or in conjunction with Maggot Man, perhaps as a form of minion. Indeed, in r2, which I just uploaded, I've re-named it Maggot Minion. Andy, in your entries I've changed it from past to present tense. While I understand they are extinct creatures in any other sense, in the Field Guides we are listing creatures intending to be used in adventures, so they need to be alive for at least that purpose. One way to make the Maggot Minion to be seen as suborditate to the Maggo-Man, is to make it move crawling, not walking. Also, when it fails a Morale roll, instead of running aways (which it can't), it disintegrates into hundreds of harmless worms. Here is my version of the Grimfrog. I hope you'll like it. From now on, I'm probably going to focus on Field Guide 2 and will come back here later, when there are more creatures to play with. Don't hesitate to contact me if you'd like me to draw something in particular. This creature is an acient elven king, corrupted with demon blood, becoming virtually immortal. I retains his mind but has become evil ever since. He resembles a dark-skinned elf with horns or antlers and non-functional bat wings. Recovery. Each combat round the Misguided King doesn't recieve damage and doesn't attack, he recovers 1d8 hp. When his hp reaches 0 (zero), the King appearently dies but, if no further damage is dealt, he recovers 1d8 hp and returns to life. The only way to kill the Misguided King for good, is to cast at him either Remove Curse (it only works if the King is at 0 hp) or Dispel Evil (it works only after the King has lost half his hit points). Both spells have the same effect on him: his body falls and decays quickly, leaving only dust. Elf bugs are diminute humanoids that resemble human bodies without sexual organs, with insect wings and eyes; their heads are hairy as that of a bee and have two antennae and pointy ears. Their skin color ranges from pale green to pale violet, and their hair can be any color and don't wears clothes. Their faces look human, but when they attack as a swarm, they reveal insect-like mandibles with wich they bite. They only attack in groups, each hit point of the swarm representing one individual elf bug. Elf bugs have hivemind and coordinate without talking or any other visible way of cummunication, they always know what to do (that's why, unlike insect swarms, elf bugs can make saving throws). Bloody needle. Each individual elf bug bears a sting, thorn or splinter as a weapon. The swamp attacks with these, causing either 3d4 or 4d4 damage, according their Hit Dice. If bloody needle is succesful, the swarm has a 50% chance to lose the ability to use this attack again (weapons are lost, broken or nailed into the victim's flesh). Once the elf bugs have lost their weapons, they will attack as an instect swarm, biting their victim causing damage of 1d8 (3 HD) or 2d4 (4 HD). As a swarm, they are hard to hit, therefore the high AC, but unlike insect swarms, they are not immune to normal weapons. Torches and similar fire "weapons", reduce the swarm's AC to 15 and cause 1d4 damage. If found in a dungeon or underground tunnels, they don't possesses treasure. 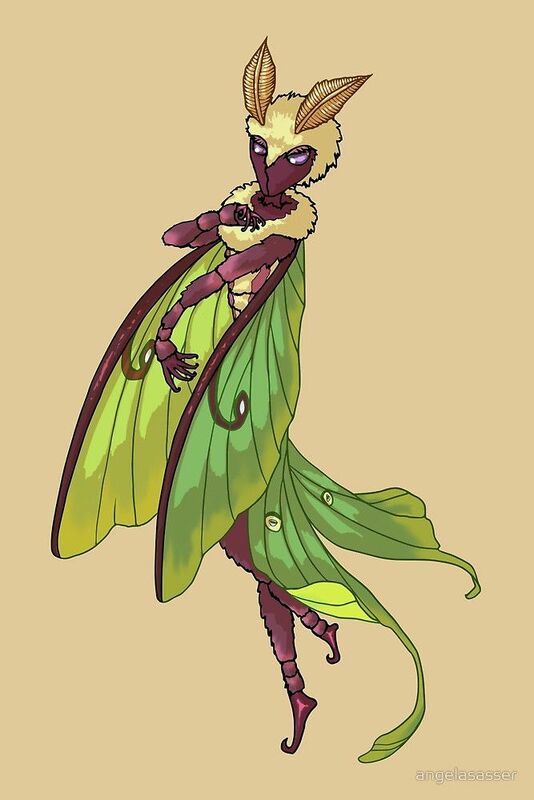 If found in a forest or glade, they have treasure type E. If encounter in their lair (a grotto or cave in the forest), they have treasure type F.
This is the queen of the elf bugs, and she can only be encounterd in their forests (treasure E) or grottos (treasure F). She resembles a normal sized woman without sexual organs; has moth wings and other moth features (antennae, faceted eyes, hairy head). Her skin ranges from pale green to pale violet. Doesn't wear clothes. She attacks with shortswords, hand axes, or other small hand weapons she collects from her victims. Every other round, the queen can fire magic missile as a 7th level Magic-User. This is a natural ability of the queen and no preparation ahead of time is necessary. Very nice entries, and the latest artwork from Werna! Just like for r2, it'll be awhile before r3 is uploaded, but keep them coming! A Spellgoat lives a normal goat's life with the exception than when distrubed, angried or scarred a magical effect occurs around them, in game terms choose 6 Level 1 Magic User Spells and form a list and whenever the situation rise roll a d6 with the number rolled being the spell casted. A spellgoat can only "cast" a specific spell once per day. Remnants of a dwarven clan cursed by the Forgefather for thier idleness, the Kirurkin are doomed to roam the wprld looking for, but never finding, rest. Looking like zombie dwarves in tattered, old-fashioned clothing, the Kirurkin stumble towards their victims reaching out with their hands. A hit by a hand inflicts 1d4 cold damage and the victim must make a saving throw against paralysis. If the save is failed the victim becomes calm and is paralyzed. The Kirurkin holds onto the victim and drains 1 point of Constitution and inflicts 1d4 cold damge each round afterwards. While holding its victim, an omotharkin will plead desparingly, saying "Help Me", "Rest", etc. A victim being reduced to 0 Constitution becomes an omotharkin the next round unless a 'Remove Curse' spell is cast on the body, in which case the victim falls asleep for ten rounds, recovering to one point of Constitution in this time. Otherwise, Constitution is recovered at the rate of 1 point per hour. An omotharkin reduced to 0 or less hit points falls to the ground but will rise, with full hit points, five rounds later unless a 'Remove Curse' spell is cast on the body. If a holy symbol is laid on the body of an omotharkin, it will not rise until the symbol has been removed. Omotharkin can only be hit by magic weapons and can be turned as a Mummy.